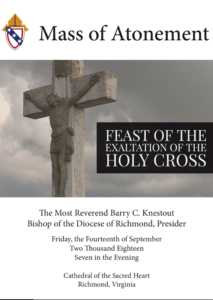 Bishop Knestout will celebrate nine regional Masses of Atonement with the faithful. The Masses begin at 7:30 P.M. at the locations and times provided below except where otherwise noted. All are welcome. As part of the Mass of Atonement, Bishop will remove the symbols of his office and prostrate himself before the cross and altar during the service. The prostration, similar to the prostration at the Good Friday liturgy, signifies contrition, humility, reverence, deep anguish for the suffering Christ, and too, the grief and sorrow of the Church. 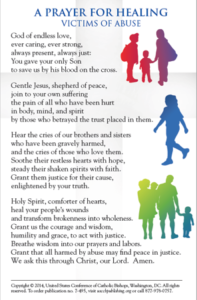 For more on the Mass, please click on the worship booklet below. If you are unable to join us for The Mass of Atonement at the Cathedral of the Sacred Heart in Richmond, you can watch the Mass while it’s live streamed here and on our YouTube Channel.